Since 2002 several European Institutions have set up a collaboration in order to implement the early stage training in the field of Astroparticle Physics by promoting the mobility of students and young researchers within the Doctorate Schools and by jointly organizing yearly International Schools on Astroparticle Physics (ISAPP). The courses aim to complement and integrate the training provided by the individual doctorate schools, as well as to enhance interactions among research students from different countries. Every year ISAPP organizes a 15 days or two times 10 days of intense schools, held either in two different sites or in two consecutive events in the same site. The school is conceived as a didactic course of lectures at the level of a doctorate school, which can be recognized as courses of their own Doctorate School with ECTS, and are opened to doctorate students and young researchers from any Institutions, even if not members of the ISAPP network. The ISAPP schools are organized by turn in the various countries of the network. The physics subjects treated by turn in ISAPP concern: Neutrino Physics and Astrophysics, Dark Matter, Dark Energy, CMB, LSS, Cosmic Rays, Early Universe, Gravitational Waves. Large time is left for discussions among students and teachers. Since 2012, ISAPP Summer Schools are sponsored by the Helmholtz Alliance for Astroparticle Physics (HAP). 2004 was the first year for the school for astroparticle physics. The school happens every year in October and addresses mainly PhD students of all fields of experimental and theoretical astroparticle physics. The school for astroparticle physics intends to give broad basic knowledge to young academics in those physical sections, that are basic for astroparticle physics (astro physics, particle physics and cosmology) and also intensly present current topics of astroparticle physics. In addition the school aims to encourage networking for participants and academics and such enhance cooperation between astroparticle physicists. The experimental research groups of the graduate program are participating in the CMS experiment at the LHC accelerator in Geneva, in the AMS experiment on the International Space Station, in the Pierre Auger project in Argentina, in the IceCube experiment at the South Pole and in various experiments of neutrino physics. By combining astro-particle physics and particle physics at one site we have the possibility that these questions can be examined with complementary approaches in the interplay between theory and experiment. The individual research groups in Aachen are each positioned very well in their fields. The Bonn-Cologne Graduate School is a joint Program of graduate studies between the Universities of Bonn and Cologne. The program leads students with a B.Sc. degree through a M.Sc. phase directly to doctoral studies (doctoral degree Dr. rer. nat., German equivalent for PhD). Students who successfully apply for the honors branch, receive a MSc/PhD degree with honors. Combining the offers of two Physics departments results in high-level graduate education and a challenging research environment on the forefront of modern physics. BCGS is funded through the Excellence Initiative since 2007. A Research Project for exchanging Ph.D. students between University of Hamburg, Laboratoire Astroparticule et Cosmologie (APC) in Paris, France, and Department of Physics, University of Oxford, United Kingdom. 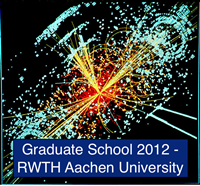 The Karlsruhe School of Elementary Particle and Astroparticle Physics: Science and Technology (KSETA) is the Graduate School associated with the KIT Center Elementary Particle and Astroparticle Physics KCETA , which bundles experimental and theoretical research and education at the interface between astronomy, astrophysics, elementary particle physics and cosmology. The school was opened in November 2012. KSETA provides the opportunity for optimal training of young doctoral researchers (physicists and engineers) for careers in science and industry through research within international large-scale projects in the fields of particle and astroparticle physics. Graduate School "Symmetry Breaking in Fundamental Interactions"
The Graduate School "Symmetry Breaking in Fundamental Interactions" at Johannes Gutenberg University Mainz offers an international PhD program, which focuses on graduate training through excellence in research in the fields of elementary particle physics, hadron physics, atomic physics, and nuclear chemistry. Scientists from the Institutes of Physics and Nuclear Physics have joined in an interdisciplinary effort to study the role of symmetries and symmetry breaking in fundamental physics on all energy and length scales, using a variety of experimental and theoretical methods. Kepler School "Particles, Fields, and Messengers of the Universe"
The Kepler Graduate school "Particles, Fields, and Messengers of the Universe" exists as a network of graduate programs since 2010. Doctoral students can benefit from an interdisciplinary graduate program combining nuclear-, particle- and astrophysics, which are the fields of Kepler Center. "Theoretical Astrophysics and Particle Physics"
Since October 1st 2005 the Institute for Theoretical Physics and Astrophysics at the University of Würzburg has a DFG-funded International Research Training Group entitled "Theoretical Astrophysics and Particle Physics", wherein several grants for PHD studies will be offered. The established cooperation between the chairs in astronomy, particle physics and computational physics and the section of applied mathematics provides the graduate students with ideal conditions for interdisciplinary studies and research - research that comprises current subjects like dark matter and dark energy, physics of the early-state universe or phenomenology of elementary particles beyond the standard model.